All parents want their children to feel safe and welcome wherever they go. We understand that this is of even more concern to LGBTQ parents, and parents of LGBTQ children. Camp Quinebarge is an LGBT friendly summer camp. We are committed to being an open, inclusive environment to all who choose to join us. Beyond that, LGBTQ campers, parents, and staff feel supported, safe, and welcome here. Camp Quinebarge is an intentionally inclusive community, where we not only value and respect all people, but accept and welcome them. Along those lines, we understand that everyone is unique, including in the expression of their gender. Camp Quinebarge accepts campers and staff regardless of their gender identity or expression. As with any sensitive personal information, we consider the gender identity of our participants and staff to be private unless the individual wishes to share it. Any transgender or non-binary person who wishes to keep that information private has the right to do so, and we will not share that information with anyone except medical staff when appropriate. We welcome transgender and non-binary individuals, and are happy to make reasonable accommodations for privacy. However, Quinebarge does not have gender-neutral housing onsite. 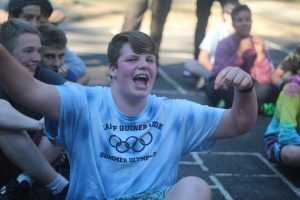 We ask that all campers, CITs, and staff live in a cabin that best fits their gender identity in everyday life. 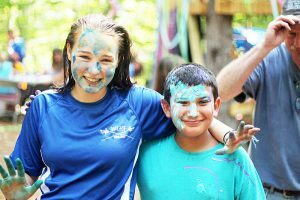 We encourage any camper, CIT, staff member or parent to reach out to us to discuss how best to work with their situation for the benefit of our entire camp community. One of the most beautiful aspects of Camp is that it brings together people of diverse backgrounds, allowing them to learn from one another while sharing the fun and forming strong bonds of friendship. 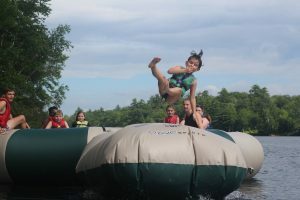 Between choice activities, unique Monkeytown programming, and cabin bonding experiences, we guarantee campers will have the summer of a lifetime. Even more importantly, we know they will go home with friendships that will last for the rest of their lives.